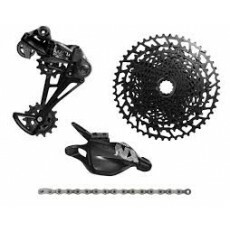 The new Sram NX Eagle Group is the entry into the 1x12-speed world and with this kit you can upgrade your bike. The Group delivers consistent performance every time out. Lower-priced 1x12-speed Group: the SRAM NX Eagle. Eagle™ Technology revolutionized the mountain bike experience by offering riders a 1x drivetrain solution that is purpose-built to be lightweight, strong and intuitive, with the gear range to ride on any terrain. NX Eagle™ drivetrain is the newest addition to the Eagle™ 1x ecosystem, and shares technologies with XX1, X01 and GX drivetrains, which makes it 100-percent compatible within the Eagle™ ecosystem. NX Eagle™ delivers an ease of entry that will bring the benefit of Eagle™ range and Eagle™ performance to more riders than ever before.